The varied topography of the Simien Mountains National Park offers a habitat to a wide range of animals and plants. The following is a compilation of data on some prominent endemic species found in the Park. The Walya ibex has become a national symbol, and the species is the primary asset for tourism development in the Simien Mountains. It is endemic to the Simien Mountains, and is one of the most endangered mammal species in the world. The low number of animals, poaching, and the very restricted areas of remaining habitat threatened to eradicate the species altogether. Walya ibex live on the steep slopes and grassy ledges of the escarpment. Their number, as estimated by international experts, fluctuated from around 150 individuals in 1969 to about 400 in 1989. and to 250 individuals in 1996 (Nievergelt et al., 1998). Recent counts by the local Park staff estimate that the number of Walya ibex has risen (2003). Walya ibex seem to react flexibly to direct pressure and to impacts on their habitat. While their main habitat was the central part of the present National Park in the mid-1960s, they expanded their habitat to the area around Sankaber and to the eastern part of the high plateau after the establishment of the National Park in 1969. Military fighting in the western areas near Sankaber in 1989 and 1990 led to intense disturbance of the animals, which was further exacerbated by increased poaching in these areas. Die surviving ibex moved towards the eastern parts of the Park and beyond, and were increasingly sported in the most inaccessible parts of the escarpment. Most of the threats to long-term protection of the species are caused by human disturbance. In 1994, an estimated 15,000 people were living or cultivating land within the Simien Mountains National Park (Hurni and Luth, 2000). Pans of the steep cliffs — representing the main habitat of Walya ibex — are used for (shifting) cultivanon, livestock grazing and fuelwood collection. This steadily expanding human use leads to soil degradation and overgrazing, and finally to the use of areas that are only marginally suitable for agriculture. The second large mammal found in the Park is the Simien fox. This species is endemic to Ethiopia. It was already rare in the Simien Mountains when the National Park was established. In 1990, the species was registered as endangered in the Red Data Book of the World Conservation Union (IUCN). The Shen fox population in the Simien Mountains is estimated to be only about 40 animals. approximately one quarter of which live within Park boundaries. Simien foxes are mostly found in afro-alpine mountain habitats at altitudes above 3600 m asl. A larger population lives in the Bale Mountains National Park in southern Ethiopia. With a total number of less than 400 animals in Ethiopia. it is questionable whether the species is in a position to ensure population viability in the long term. 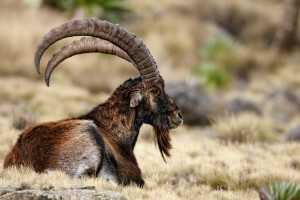 As with the Walya ibex, the main threat for the species is poaching and decreasing habitat. 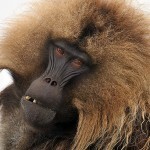 The Gelada baboon, also called ‘The Bleeding Heart Baboon’, is endemic to Ethiopia. The animals are found on most of the highland plateaus of the Simien Mountains, inside and outside the Park, and their total number has been estimated at more than 3000 animals. Due to the absence of natural enemies, the population is still on the increase. The baboons live in herds of 100 to 200 animals, and their occurrence has been reported from most highland areas above 3000 m asl. As the Gelada baboons are not too shy, the animals can easily be approached. The main diet of the Gelada baboon consists of grasses and roots. This has led to conflicts with peasants, who fear extensive destruction of their crops. More than 180 bird species are found in the Simien Mountains. Six species are endemic to Simien. Among the most spectacular bird species in the area are the Bearded vulture (Gypaetus barbatus), the Tawny eagle (Aquila rapax) and the Thick-billed raven (Corvus crassirostris). In addition to the varied fauna, the Simien Mountains boast a unique flora. Three different vegetation belts can he distinguished. The highest altitudinal belt is the afro-alpine steppe belt, found above 3700 m asl. This grassland zone is characterized by the occurrence of the giant Lobelia (Lobelia rhynchopetalum). Measuring up to 10 m in height, the plant grows for as long as twenty years before flowering for the first time and then dying. The next lower altitudinal belt situated between 3000 and 3700 m asl — the Ericaceous belt — takes its name from the various forms of Erica bushes and trees that are found in this zone. The most prominem form is the giant Heath (Erica arborea), which was once widely found in the Park. Increasing demand for fuelwood has tremendously reduced its distribution and occurrence. The lowest altiturfinal belt inside the Park. between 2000 and 3000 m asl, is called the afro-montane forest belt. It is mainly found at the bottom of the steep parts of the escarpment, in the lowland areas to the north of the Park. This vegetation belt is characterized by sclerophyllous trees in general, and the presence of the Ethiopian Tid (Juniperus procera) as well as various species of Acacia in particular.